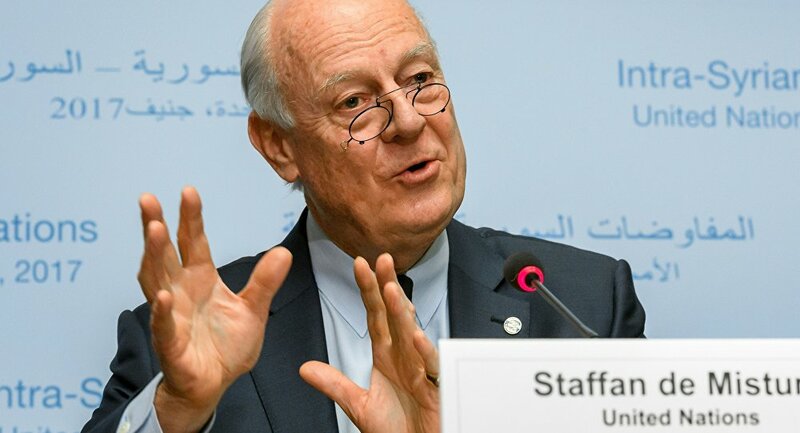 The fifth round of the intra-Syrian talks in Geneva wrapped up Friday with UN Special Envoy for Syria Staffan de Mistura metaphorically characterizing the latest round as a "train that started slowly to move." GENEVA (Sputnik), Anastasia Levchenko — However, it is still unclear whether de Mistura is still aboard this train himself, as the his contract as UN Special Envoy expires on March 31 without an official statement yet made from either UN Secretary-General Antonio Guterres or de Mistura himself on whether the mandate has been prolonged. This latest round of talks, which started on March 23, revolved around the four core groups of issues of debate, or baskets, which were designated during last month's talks: governance, constitution, elections and counterterrorism. All four baskets were to be discussed in parallel, as de Mistura put it. Although the delegations spent the first days of the talks accusing each other of not being serious and prioritizing one key topic of discussion above the others, de Mistura said that, in the end, all sides addressed all issues and went into details and substance. Initially, the Syrian government delegation, headed by Bashar Jaafari, focused on counterterrorism, while the opposition's High Negotiations Committee (HNC) wanted to discuss political transition first, insisting that there is no place for president Bashar Assad in a future Transitional Governing Body (TGB). "All invitees have gone into considerable detail in substance… They were serious and they engaged. Even though they deny it, I know," de Mistura told reporters summarizing the round. Getting down to substance, however, was a hard pill to swallow for the HNC delegation. Its National Coordination Committee (NCC) could not come to a consensus with the Kurdish representatives in the HNC delegation on a common vision of governance and political transition. As a result of this discord, the Kurds decided to freeze their participation in the delegation and its meetings. They may soon decide to fully separate from the HNC, which would aggravate the situation with the Kurdish representation at future talks. As in previous rounds of talks, the latest one in Geneva looked like a continuous exchange of non-papers. The HNC submitted their vision on political transition, and the Damascus delegation their vision on counterterrorism and core principles of the political settlement to the special envoy. Meanwhile, both the Moscow and Cairo platforms of Syrian opposition came up with proposals on how the talks need to proceed with forming of the working groups to discuss each of the baskets. The United Nations, on its end, produced a non-paper summarizing the commonalities of all delegations' visions. Vitaly Naumkin, a Russian adviser to de Mistura, and Deputy UN Syria Envoy Ramzy Ezzeldin Ramzy contributed to the summary. De Mistura specified that the United Nations has no plans on making the non-paper public at this moment. The future of de Mistura's mandate has been subject to many rumors at the latest round of Syria talks. His contract officially ended on March 31, the last day of negotiations. However, until now, there has been no official statement from the UN secretary-general or de Mistura himself on whether he will continue his role as UN special envoy. However, Sputnik learned from various sources that de Mistura's mandate has been prolonged for six more months. The next round of intra-Syrian negotiations is expected to take place days after the upcoming meeting on Syria in Astana on May 3-4. The date will be announced by de Mistura after his consultations with the UN Security Council on April 6-7.